This hotel is close to the center, close to the train station. It needs a little bit of TLC. 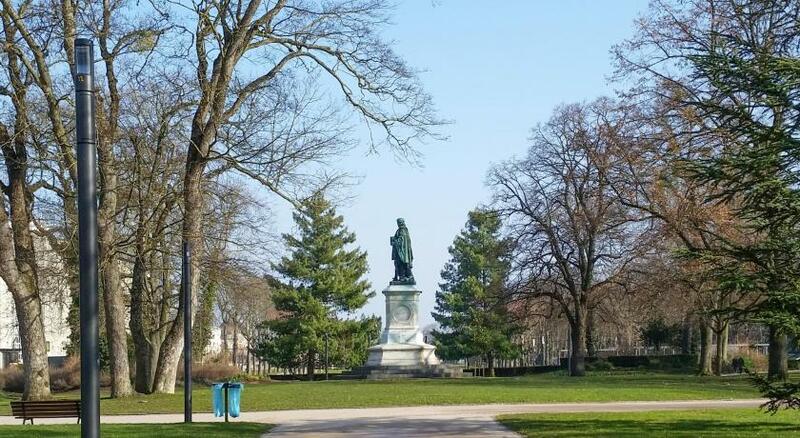 We only stayed for one night, as we just went to Reims for the Champagne tour. I’m not sure if I’ll book it for a longer stay. The best part was the staff, super accommodating and gave us good restaurants suggestions. Excellent location, friendly staff, convenient breakfast. Location and price were good. Room nice size. Good extras - kettle and fridge. The AC worked so well! So many hotel AC units fail to fully cool the room. This one was great. The lobby was nice and cool too, even in record heat. Also, all the staff were so nice, helpful, and kind. I got an amazing price from booking.com as well. And the tram was right in front of the hotel. Thanks! Everything was very good. Breakfast was delicious. Staff very hospitable and hotel was on great location: walk distance to restaurants and markets. I strongly recommend it. Good breakfast with good options. Service good - they were really gently and keep the table well served all the time. 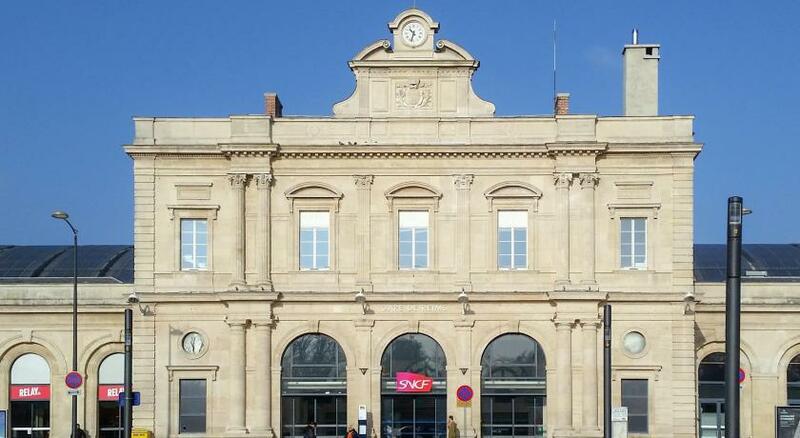 The location is great for the train station and a short walk to the centre of Reims. Bed was comfortable and the staff were friendly. The welcoming and efficient staff who gave that bit extra and the beautifully decorated public and private rooms in a hotel in a great location. 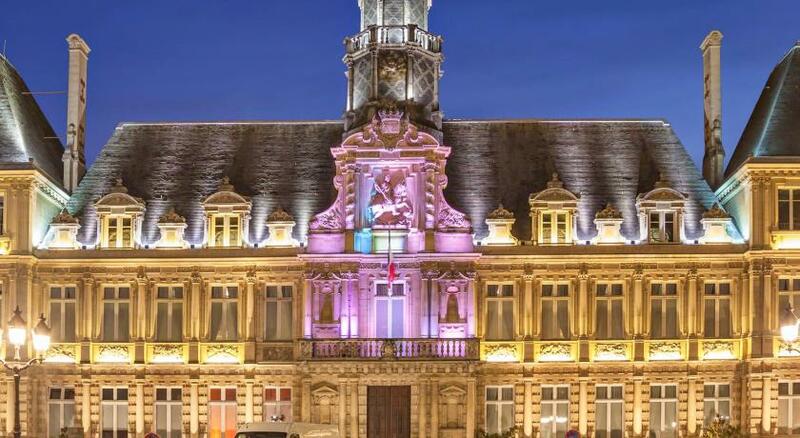 Located in the heart of Reims, a 1-minute walk from Boulingrin Tram Station, Hotel Porte Mars is also a 5-minute walk from Reims TGV Train Station and a 17-minute walk from Reims Champagne Congrès. It offers soundproofed accommodations with free WiFi. Each guest room at Hotel Porte Mars is equipped with a flat-screen TV. Rooms are also air-conditioned and have a private bathroom. A buffet breakfast is available. Guests can also enjoy the many local cafés and restaurants within a 10-minute walk of the hotel. Reims Cathedral and the Palace of Tau are both a 15-minute walk from Hôtel Porte Mars, while Reims Exhibition Center is 3.4 mi away. When would you like to stay at Hotel Porte Mars? This individually decorated room includes free Wi-Fi, a flat-screen TV, a minibar and a kettle. The private bathroom has a shower, a hairdryer and free toiletries. This individually-decorated room includes free Wi-Fi, a flat-screen TV, a minibar and a kettle. The private bathroom has a shower, a hairdryer and free toiletries. This single room features air conditioning, mini-bar and electric kettle. This single room features a soundproofing, air conditioning and mini-bar. House Rules Hotel Porte Mars takes special requests – add in the next step! All children under 2 years are charged EUR 11.50 per night in a crib. All children under 16 years are charged EUR 11.50 per night for extra beds. Any additional older children or adults are charged EUR 11.50 per night for extra beds. Hotel Porte Mars accepts these cards and reserves the right to temporarily hold an amount prior to arrival. Please note that for reservations of 5 or more rooms, special conditions apply. Please contact the property for further information. Breakfast a little overpriced considering the room price (around 50% of the room tax). I didn't find previously information about breakfast prices before coming. Very old fashioned, short beds! The shower was broken so that you had to hold the shower head. This should have been fixed before our stay. And as it wasn't, a discount could have been offered as we weren't getting the services we paid for. Hand towels weren't replaced after having been taken for washing, tea bag wasn't replaced after using, toilet roll in holder wasn't replaced. There was no milk for the tea of coffee in the room. You can see a theme here. For the price of the hotel you shouldn't have to ask for stuff to be replaced. And you can't presume everyone drinks black tea and coffee. On our last day there was no hot food for breakfast, but the price was the same as other days when there was, so we didn't have it. If attention could be paid to the above, I would stay again. Breakfast had many choices, including gluten-free bread on request. Staff was helpful to provide local information and a map of the attractions. Nearby parking was affordable, and free from Saturday 18:00 hrs (6 pm) through Sunday. Must be only hotel in france that do'esnt sell wine at the bar !! I really wish hotels would supply enough shower gel and shampoo to reflect the fact that you might want two showers. There really should not be a need to go looking for more shampoo.. is there? We got the best room we could find as french double beds do not always suit two people sharing. Rooms were spacious and worth the small extra room charge. Bed was excellent and the windows were so well glazed that the busy road outside the hotel did not seem to exist. The rooms are basic but equipped with a kettle. They had a minibar in each room. Very quiet and clean room. Good location ,not far from the center.Friendly staff .